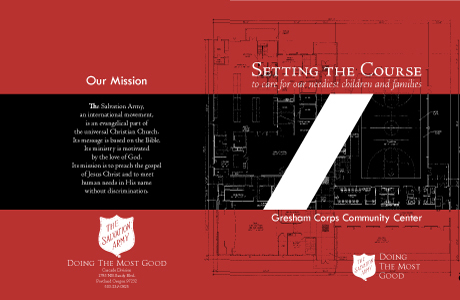 The Salvation Army is looking to solicit large donations from corporate and other sponsors to help build a new Corps Community Center in Gresham, OR. They want a high-quality and professional looking presentation, but they need to keep the cost as low as possible. There are not a lot of potential large donors in the Gresham and metro Portland community, so whatever they decide to print will be low quantity. The piece must look professional in order to appeal to potential large dollar donors (personal, foundation or corporate), and there must be flexibility to update the information in the booklets as each phase of the project is funded and completed. And of course, budget is limited, so total cost is still an important factor. Jag partnered with a local design agency to create a two-color cover with a die-cut “window” that shows a small portion of the printing on the first inside page of the booklet. The cover was low cost because it was not printed in full color. Then, the inside pages were digitally printed in color, so when closed, the booklet cover appeared to be a full-color design. Also, since the inside pages were printed digitally, we were able to produce them in smaller quantities and saddle-stitch them into the covers as needed, so we had the flexibility to revise the booklet as needed. The client received exactly what they wanted, and they paid much less than expected for the final product.